I know… I know…. another monthly box subscription. But this one is a little different in that it’s something that the entire family could benefit from for a change. 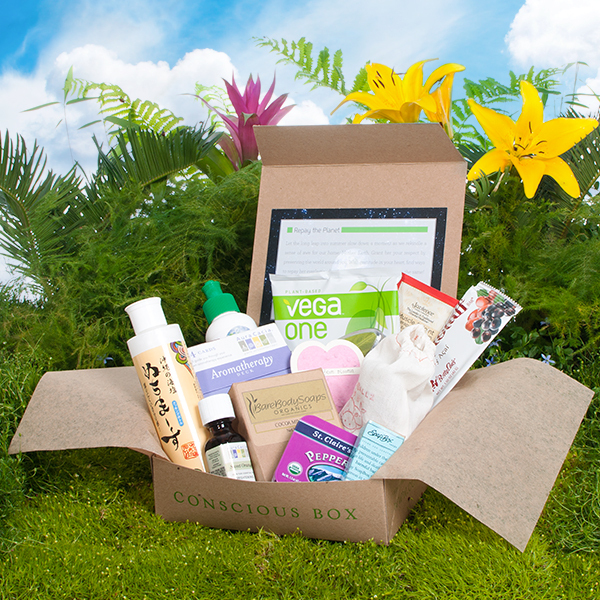 Conscious Box helps you find some great new products that are healthy, natural, non-toxic, and come from ethical companies from around the world. They have everything from beauty products to food to cleaning supplies for your home from brands like Chef Sleeve, Dapple, Teatulia Tea & Coffee, and LaLicious (you must check out the coconut cream body butter!). Each month you’ll get a box jam packed with all sorts of wonderful goodies that you can try out. After that you can leave feedback and reviews on the Conscious Box site to earn points and then purchase your favorite products at incredible discounts. They even have certified vegan and gluten-free boxes too! If you’re not sure if you want to commit to another monthly box subscription use the handy Rafflecopter widget below to enter to win a Conscious Box to try out. One winner from the U.S. will be selected and then contacted via email. The winner will then have 48 hours in which to respond before another winner is selected. In return for this giveaway I will be given a Conscious Box as well. All thoughts & opinions are my own.